Tom Palmer is the younger brother of former loan keeper Alex. Alex came on loan to us at the start of the 15-16 season and at the same time Tom joined up with our youth scheme. 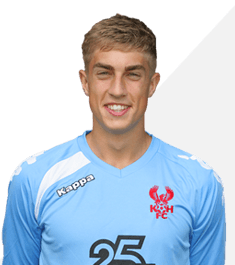 Following impressive showings at that level he was given his first pro contract with the Harriers in September 2016. He has spent some time out on loan at Stourport Swifts and Worcester City.